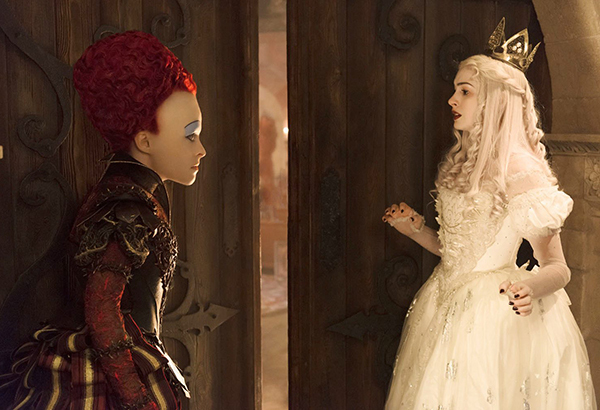 Anne Hathaway is back for her second turn as The White Queen. For her first turn, in Alice in Wonderland, the film won Oscars for Art Direction and Costume Design. The Art Direction and Costume Design are, again, top notch in the sequel and really helped Hathaway dive into her role as Mirana. “Alice in Wonderland” is such a classic book, that many of us have a childhood memory of it. That wasn’t the case with Hathaway however. Now that she has two Alice films, two Princess Diaries films and two Rio films under her belt, she is amassing quite the collection of family friendly movies. This more of a happy accident rather than part of some master plan. In Alice Through the Looking Glass, Alice is a strong young woman who doesn’t need help to get things done. Hathaway loves the messages of girl power and female empowerment the film conveys. She also has advice on how to raise a strong young woman of your own. *A Stitch in Time: Costuming Wonderland – Three-time Oscar®-winning costume designer Colleen Atwood (Alice in Wonderland, Memoirs of a Geisha) explains how costuming helps shape the curious characters of Underland and reveals hidden Easter Eggs within the cast’s ornate outfits. *Music Video: “Just Like Fire” by P!nk – “Watch this madness, colorful charade” in P!nk’s music video for “Just Like Fire,” the hit song featured in Alice Through the Looking Glass that powered to the top 10 on Billboard’s Hot 100. *Behind the Music Video – Go on set with P!nk for production of her “Just Like Fire” music video, featuring fantastical imagery, aerial stunts, Underland character cameos, and guest appearances by P!nk’s family. *Behind The Looking Glass – Jump back and forth through time during this in-depth look into the making of Alice Through the Looking Glass, hosted by director James Bobin. *Time On… – Delight in this discussion with the unpredictable and witty Sacha Baron Cohen who plays Time, the keeper of the Chronosphere, a metallic sphere that powers all time. *Alice Goes Through the Looking Glass: A Scene Peeler – View a side-by-side comparison of raw production footage and final scenes, as Alice enters Underland through a magical looking glass. *Alice Goes Through Time’s Castle: A Scene Peeler – View raw production footage alongside final scenes, as Alice enters Time’s castle of eternity. *Characters of Underland – Get to know the quirky and colorful supporting characters in Underland, such as the tubby twins known as the Tweedles (Matt Lucas) and Absolem (Alan Rickman), the blue caterpillar turned blue Monarch butterfly. *Filmmaker Audio Commentary by James Bobin – Director James Bobin delivers scene-by-scene insight into the creation of Alice Through the Looking Glass. *Deleted Scenes with Director Commentary – Bobin introduces five never-before-seen scenes that didn’t make the final cut of Disney’s spectacular adventure.